South Bank is well located in Brisbane and is easily accessible by public transportation. You can also choose to walk or cycle if you're not too far from Cultural Forecourt. If you choose to drive in spite of these options, Le Festival encourages you to share a car with other people and carpool to maximize the number of people per trip. Let's be sustainable when going to Le Festival ! And don't forget: Don't drink and drive, take public transport! Go Card - With the Translink go card, visitors can easily travel across South East Queensland on any Translink bus, ferry and railway services. Go cards can be purchased online, over the phone or from selected retailers and QR stations. Visit Translink's website (translink.com.au) for more information. At the Northern End of South Bank’s Grey Street is the Cultural Centre Busway, which services all of Brisbane and surrounding suburbs. 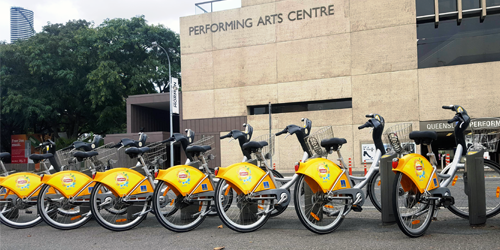 This enables visitors to access regular bus services to their chosen South East Queensland destination. Southbank is located at the crossroads of Queensland Rail network and has two train stations - South Brisbane and South Bank – both located on Grey Street. These stations provide regular train services enabling visitors to connect with the Brisbane CBD railway network and the Gold Coast railway network. The Brisbane CityCat and Ferry services are a favourite among the locals and are an enjoyable and practical way to get around Brisbane, South Bank and surrounding suburbs. Enjoy the ample sightseeing opportunities as you find your way around the river with access to key city stops including New Farm Park, South Bank and Bulimba. 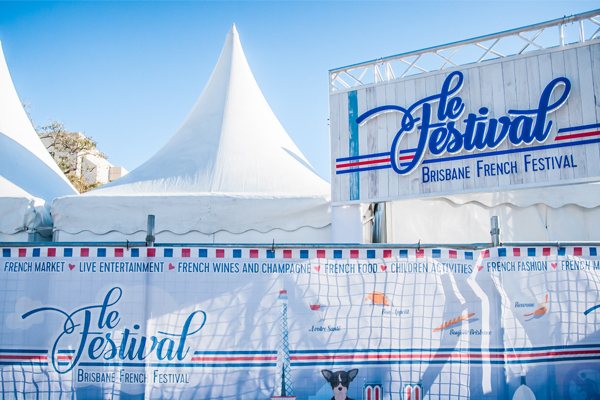 Le Festival encourages everyone to consider riding, in line with our mission to be ‘greener’ and more sustainable. CityCyle is a good way to get to Le Festival by bike. There are stations all across the city, so it’s very easy to pick up a bike. If you’re not yet a member and just want to use it to go to Le Festival, you can use the Casual Pass for $2. Remember also that the first 30 minutes of every journey are free. If your journey is over 30 minutes, usage fees will apply. You can find the CityCyle’s station map here. If you wish to drive, you can be assured that you will be able to park with ease and convenience at the South Bank car park accessible from Little Stanley Street. South Bank car park offers more than 800 spaces, including eight disabled bays, with accessibility via lift and stairs from both the North and South entrances. South Bank is proud to be an accessible precinct for all visitors. Key information is below, however, if you have any questions, please contact the South Bank Visitor Information and Booking Centre on 07 3156 6366. South Bank’s underground car park (located on Little Stanley St) has several disabled parking bays, which are conveniently located near the car park lifts at the northern and southern ends of level B1. Wheelchairs and strollers are both available for hire from the South Bank Visitor Information and Booking Centre. In addition to standard wheelchairs, there is also a purpose-built pool wheelchair and purpose-built beach wheelchair available. Standard wheelchair and stroller hire fees are $6.50 for half a day (up to 4 hours) and $12.50 for a full day (4 hours and over until 5pm). The pool wheelchair and beach wheelchair are free to use and can be hired for a maximum of two hours only. When hiring all wheelchairs (including pool and beach wheelchairs), you must present photo ID and leave a $50 deposit which will be refunded when you return the wheelchair. When hiring a stroller, you must present photo ID and leave a $20 deposit which will be refunded when you return the stroller.